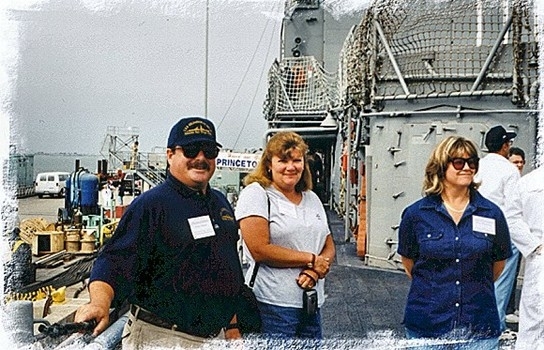 The first “official” reunion of the USS Goldsborough was held in San Diego, California June 18th through the 22nd at the Hanalei Hotel, as part of the Tin Can Sailors National Reunion. There were 18 former Goldsborough crewmembers and several spouses in attendance, including four of the ship’s Plankowners. Bob Crooks, Earl Hall, John Maguire and Jim Nechanicky were all members of the commissioning crew. The Tin Can Sailors put on a well organized event. The food and entertainment was excellent. Monday evening’s Welcome Aboard dinner featured speaker Vice Admiral Edward Moore, Jr., Commander, Naval Surface Force, United States Pacific Fleet. On Tuesday our group went aboard one of the Navy’s Ticonderoga Class AEGIS Guided Missile Cruisers, the USS Princeton (CG-59). The ship tour was followed by a bus tour of San Diego, and a lunch cruise in the harbor. On the last evening was the Luau Banquet, complete with a roast pig and all the trimmings. Everyone was decked out in true Hawaiian style. The Motu Nehenehe Polynesian Dancers and Drummers provided the entertainment. Kudos to Tom Pelton and the staff of the Tin Can Sailors Association for hosting a most memorable event. We are looking forward to meeting up with Tin Can Sailors again. And thanks to Tom Weaver for getting our first official reunion organized.